The one where we barely moved 15 metres! One by one, everyone arrived on site and then after the Health & Safety briefing we got started. We headed downstream to where we finished the last time we tackled this site. 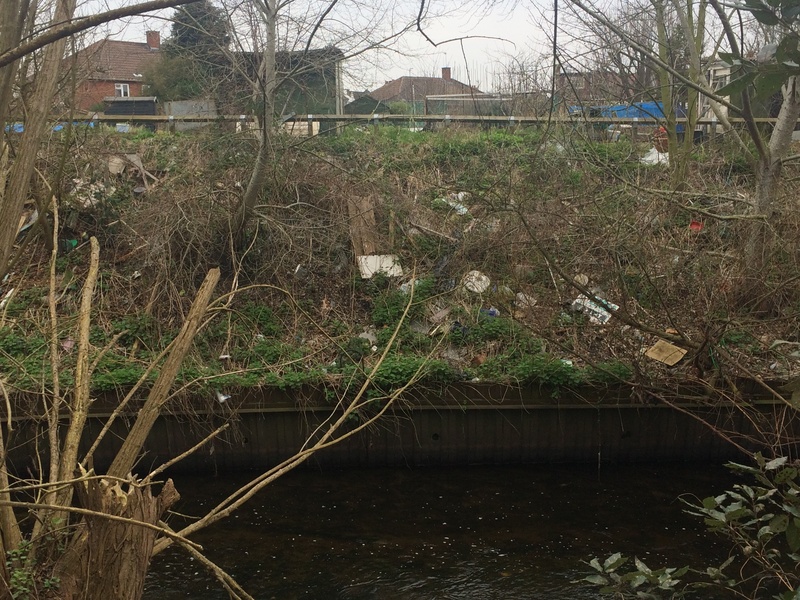 As soon as we arrived we saw the opposite bank was covered in rubbish and we just couldn’t leave it that way. 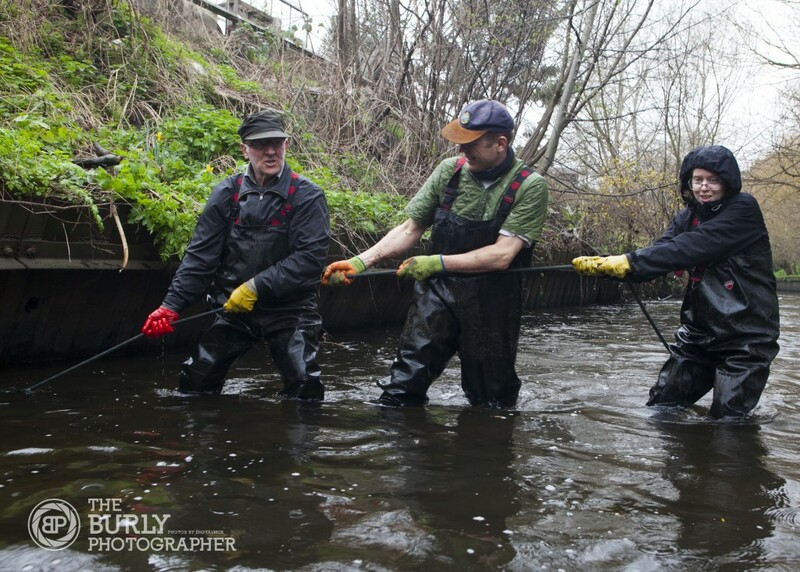 Waders got in, waded across the Wandle and then climbed up the bank to tackle the fly-tipping. 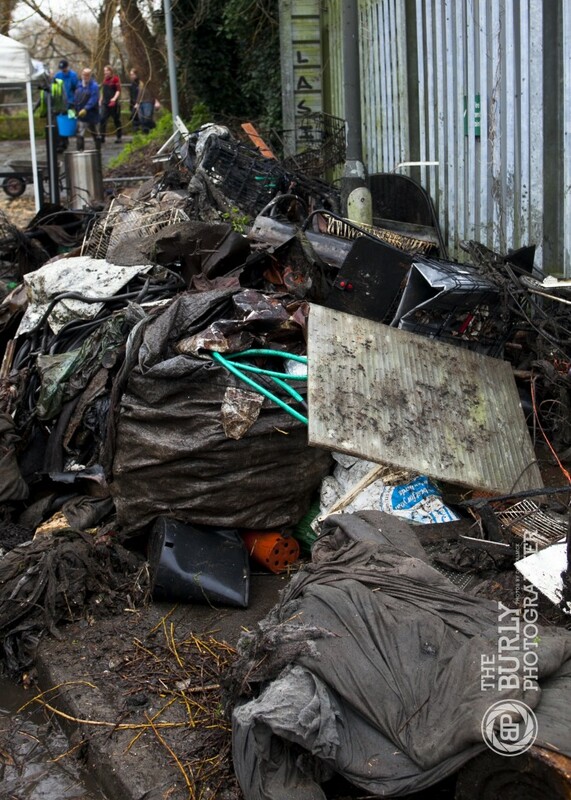 It didn’t take long before the bank support team was overwhelmed with rubbish and we had to gather extra recruits from the litter picking team. One of the first big finds was a roller. 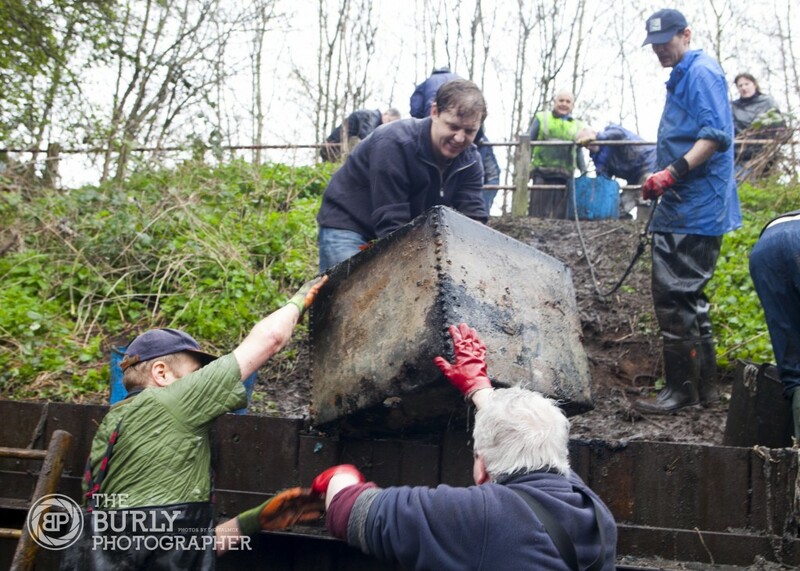 Although very heavy, it was designed to roll and so getting it up the bank couldn’t be too difficult, right? Turns out, yes it could! 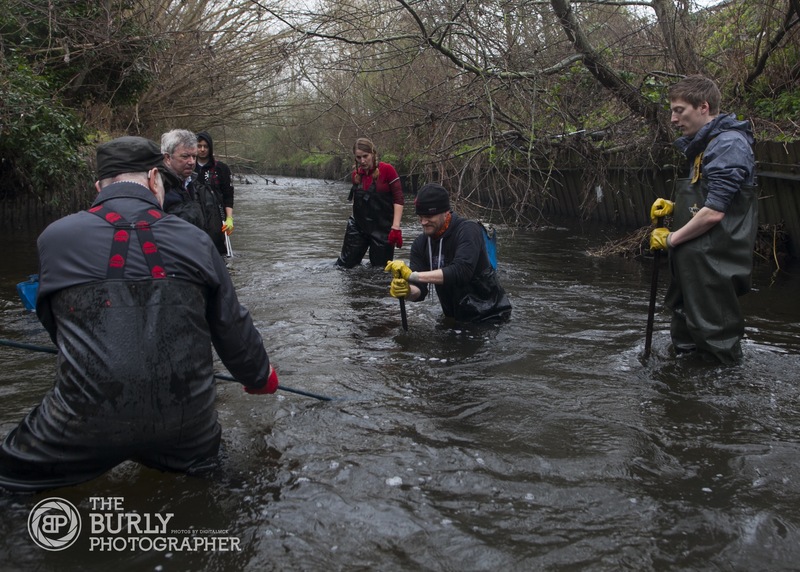 Next, a mattress was found in the Wandle which proved trouble for the waders and bank support alike. 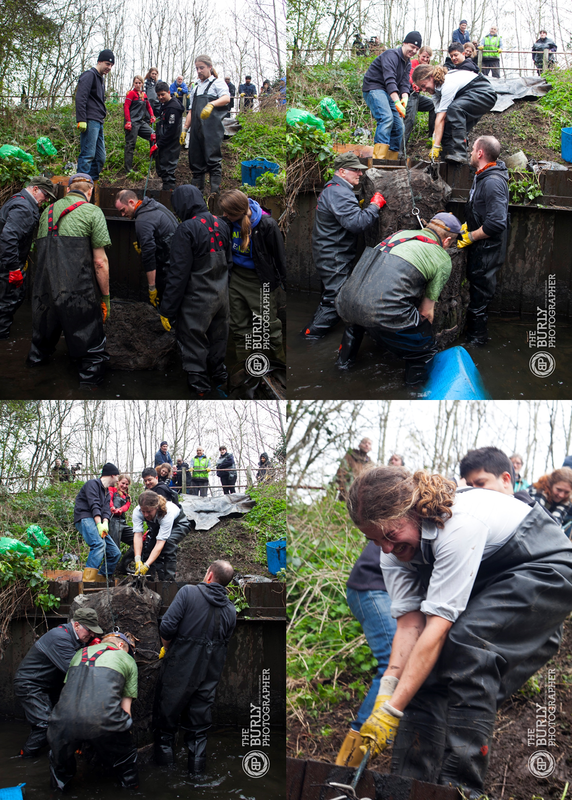 Having absorbed so much water and silt, the mattress was extremely heavy and getting it up the bank revetment and then up the steep bank was near impossible. 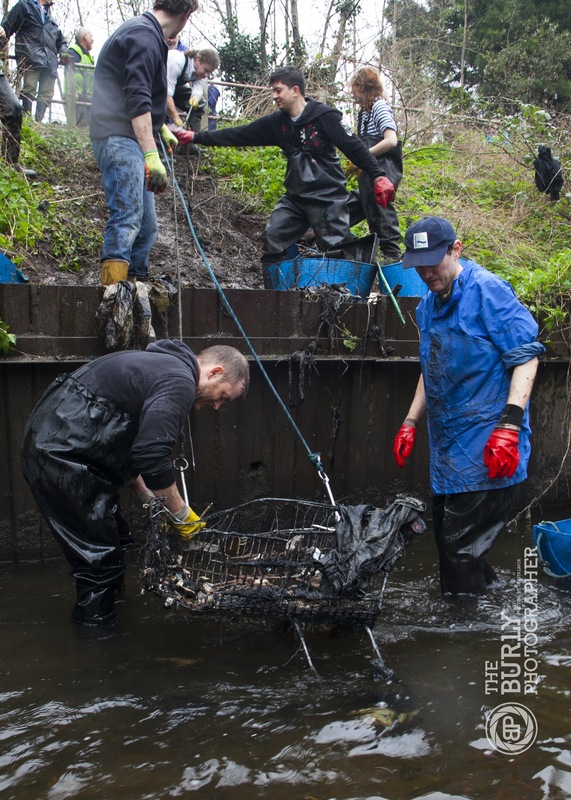 Derek used his magical powers to sense rubbish hidden below the silt. 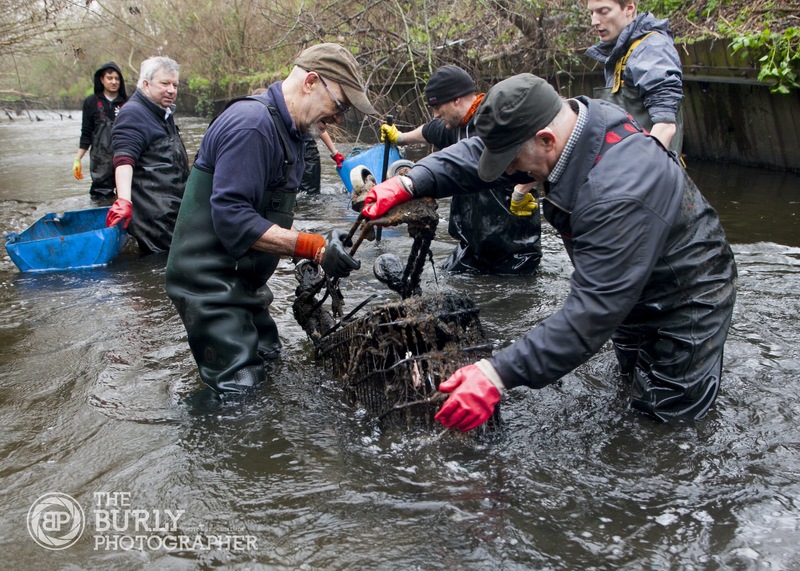 With everyone on the rope, the mystery object was pulled free and the trolley was heaved by the bank. 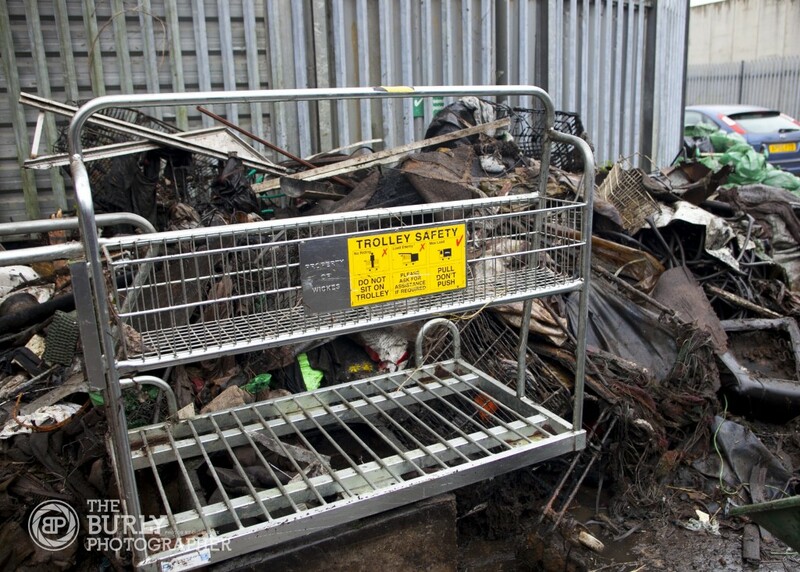 Shame the wheels didn’t work to get it back to the rubbish pile! At lunchtime we headed back to the tent for some cake and drink, as well as shelter from the rain. We had some lovely homemade cakes which went down a treat. With the rain not stopping, we decided to get back to the river and finish what we’d started. 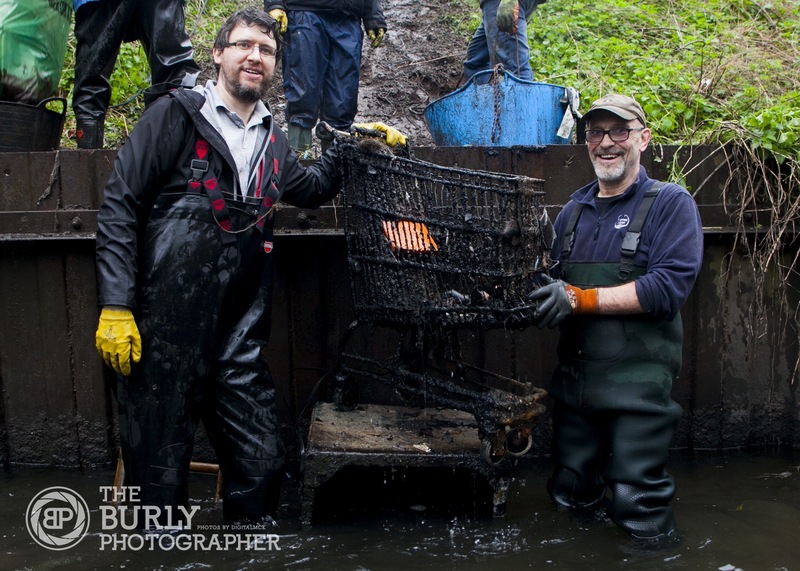 After lunch, Derek found yet another trolley deep under the silt. With several people on the rope, we managed to pull this one free and get it up the steep bank as well. 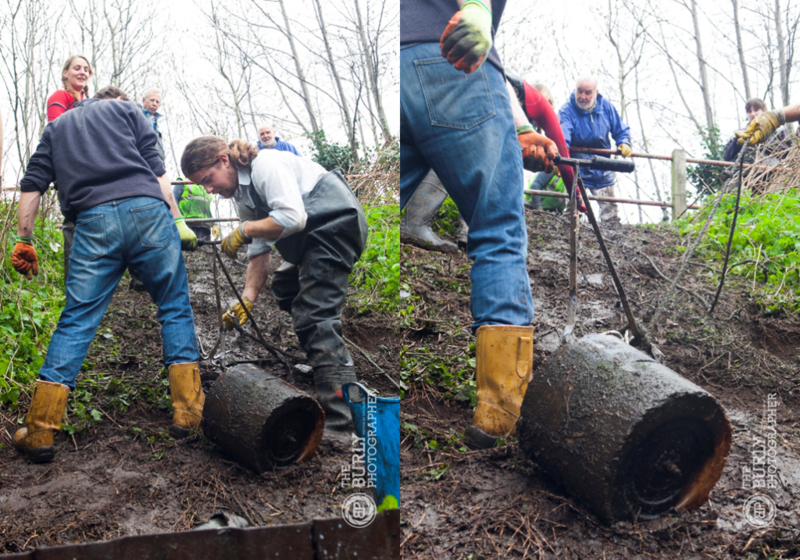 Another challenging find was this metal water tank/safe – full of silt and very difficult to attach the ropes to! 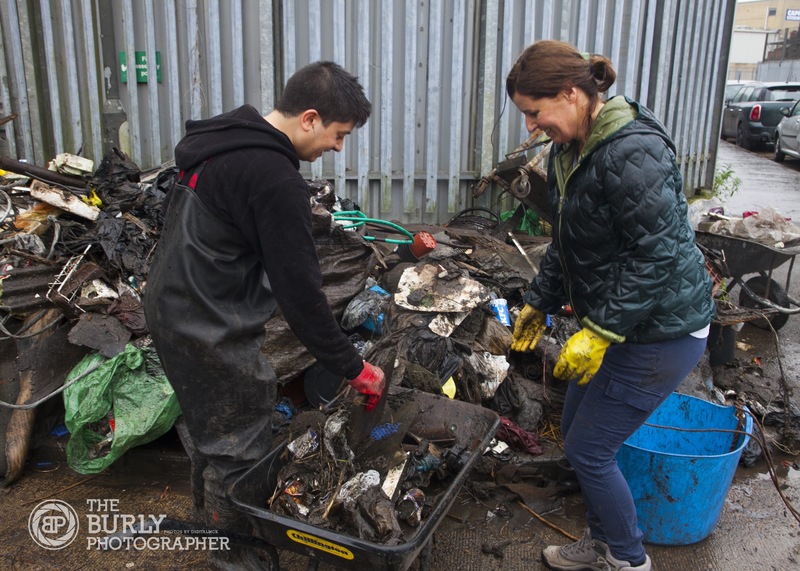 At the end of the day everyone was wet, the rubbish pile was sky high and so we called it a day for another Wandle cleanup. So what did we find? 1 mattress, 1 roller, 1 jump lead, 1 safe, 1 coconut, 1 skateboard, 1 back of a TV, 1 computer monitor, 1 flatbed trolley, 1 tape player, 1 traffic cone, 2 trolleys, 3 bike tyres, 4 car tyres, 7 carpets, 10 car mats, lots of piping and wood, many, many plant pots and much more rubbish. Huge thanks to everyone who helped unpack and pack up the van during the event, Ann for supervising the Event Tent and for baking some treats, Big Yellow Wandsworth for providing free storage space for our equipment and the Waste Team at Merton Council for organising collection of all the rubbish the next day. 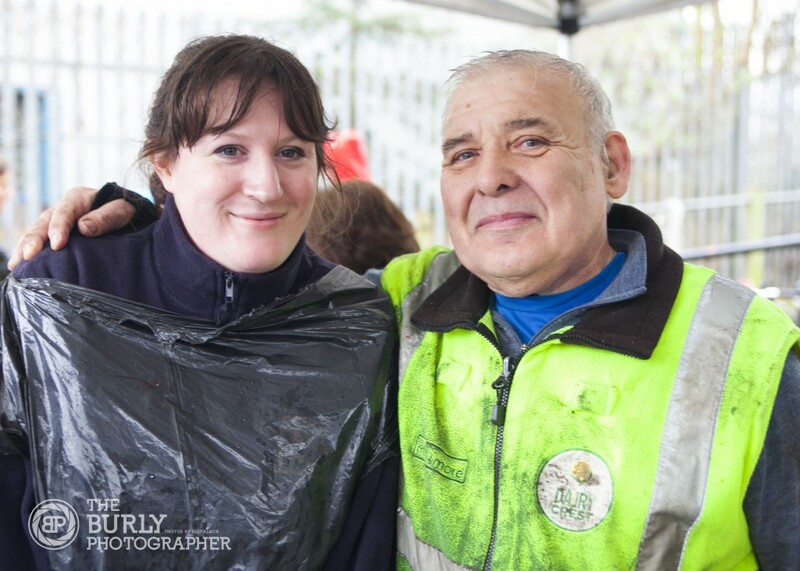 We’d also like to say a big thank you to Richard from The Burly Photographer, who came and took some great photos of our event! 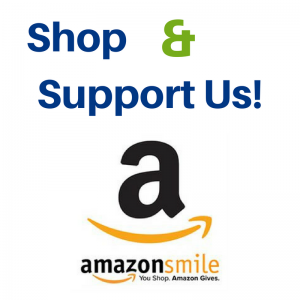 Thank you to all our volunteers for coming: Aaron, Abbas, Andy, Ann, Anna G, Anna H, Bhadresh, Charles, Chris, Claire O, Claire W, Dave, David, Derek, Doris, Ed, Felix, Grayatri, Guy, Jane, Jason, Jiya, John, Lisa, Lucinda, Maciek, Merel, Mike, Natasha, Per, Phil, Richard, Rob, Sheila, Sonny, Steph, Stewart, Trevor, Uri, Varshan, Ved, Victor, Vishali, Wally, Will H and Will W.
So what did I learn from this month’s cleanup? That if you forget your coat and it rains, a bin bag makes an excellent waterproof. 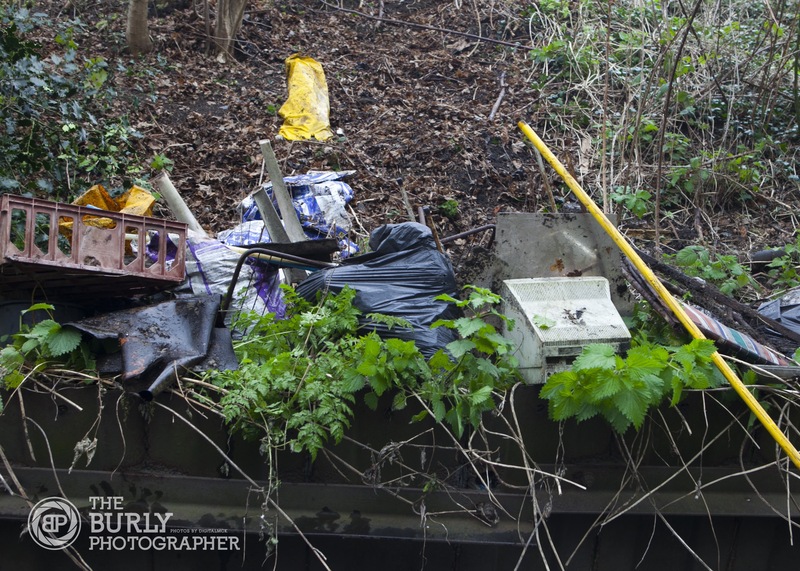 This entry was posted in Uncategorized and tagged Cleanups, Events, Fly Tipping, Merton, People, Spreading the Wandle Word, Volunteer, Wandle, Waterside Way on March 31, 2017 by Polly.